In 2015, NACEDA set out an ambitious goal: to make creative placemaking a frontline strategy for community developers. With an Our Town grant from the National Endowment for the Arts, NACEDA launched the Creative Placemaking Immersion Program. Creative placemaking engages communities in the using arts and culture to improve the physical and social character of places. A cohort of three of NACEDA members – community development associations in Ohio, Massachusetts, and Philadelphia – worked with arts partners in their regions to build knowledge about creative placemaking among local community development nonprofits. View our final report to the NEA. The Our Town grant was NACEDA’s first direct federal investment from a federal agency. Along the way, we added with our own resources, those of members, and from Woodforest National Bank. Americans for the Arts partnered with us, sharing their expertise and their network. The Ohio, Massachusetts, and Philadelphia Massachusetts networks performed robustly, providing 26 creative experiences to 275 people and organizations over 18 months. Artists engaged neighborhoods in development plans. CDCs became arts advocates. Banks became arts investors. NACEDA networks throughout the country began thinking how artists and cultural strategies could enhance the impact of traditional community development. 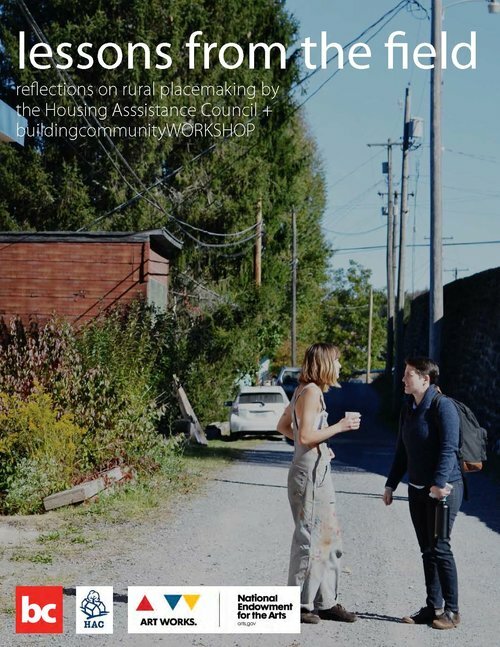 The Housing Assistance Council and buildingcommunityWORKSHOP partnered to explore how rural communities are utilizing creative placemaking to respond to the unique priorities of these communities. Their joint Reflections on Rural Placemaking outlines key lessons and opportunities for rural communities and creative placemaking. New Jersey Governor Christie's veto of funds to prevent lead poisoning hurts kids and makes no economic sense, explains the executive director of the Housing and Community Development Network of New Jersey in The Star-Ledger. Connecting the dots between community development corporations and healthy communities with Kavya Sekar of Massachusetts Association of Community Development Corporations. The National Association of Realtors takes a strong stand against reforming the mortgage interest deduction. Not all realtors agree. Maine Realtor Jean-Marie Caterina explains that reforms to the mortgage interest deduction could be "a win-win for all" − including Maine realtors. Brad Finkelstein of National Mortgage News dispels the myth that subsidization of affordable housing caused the foreclosure crisis. Community development tax credits produce enough local, state, and federal tax revenue to more than offset their cost, explains the president of the National Development Council. The closure of HUD's Minneapolis Multifamily Office was prevented by a partnership between the Metropolitan Consortium of Community Developers, Sen. Franken, Rep. Ellison... and NACEDA. The Philadelphia Association of CDCs, the Campaign to Take Back Vacant Land, and the Philadelphia Land Bank Alliance and partners persuaded the Philadelphia City Council to approve a land bank bill. ​Is Your Nonprofit A Jack of All Trades and Master of None? Tips for developing a cohesive, concise, effective elevator pitch to explain the beliefs and missions of your community development corporation. How does inequality inhibit economic growth? MacArthur Foundation report explains.